It was my childhood dream to have a horse. Those who know me, know I still adore them. I was invited to photograph at my friends horse farm, and I was in for a treat! Horses, everywhere, colts, fillies, stallions and mares and all no bigger than a minute! Yes, miniature horses! I started to take pictures, and then had to put my camera down to enjoy these affectionate little creatures. I had more nuzzles and kisses that morning, who would have thought? These horses are the most inquisitive good-natured animals that I've ever encountered. I took many pictures that morning, and when I reluctantly returned home leaving behind my "new friends" - I knew I'd have to do something special with the photos. 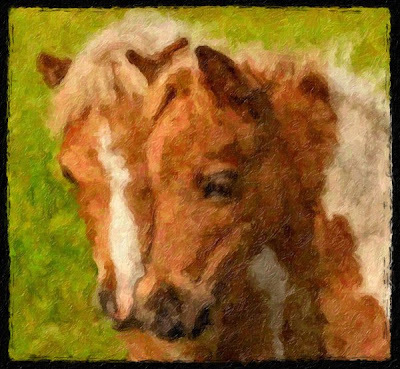 The first thing that occurred to me was to create a "painted pony" picture that would do them justice. They are such gentle creatures and there's something magical about them. With this image, I used the Impasto setting in Snap Art with a medium brush to portray them they way I envisioned. Photo tip - Shoot at eye level with your subject and move in close, (and yes, I have to clean my lenses now - but it was worth it)!